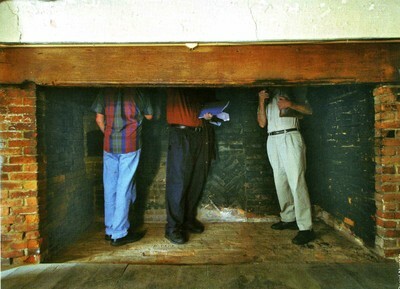 Getting a closer look at the chimney in the 17th century Boardman House in Massachusetts. This month Historic New England launched, “Insight on Site: Inside the Old House” to give historic homeowners an opportunity to go behind the scenes with staff and learn how to date building materials and identify architectural styles. Insight on Site takes visitors into parts of Historic New England properties rarely seen by the public, such as the Modern house located adjacent to the newly acquired Eustis Estate in Milton, Massachusetts; a caretaker’s residence at the seventeenth-century Browne House in Watertown, Massachusetts; and the newly reacquired Jewett Eastman House in South Berwick, Maine. Free and exclusively for Historic Homeowner members, the series of four Insight on Site programs runs from January 12 to April 6. Behind-the-scenes tours are always a hit with the public because they provide special access to the house, collections, and staff–it’s a great way to both advance your educational mission and build support, both short and long term. For example, Drayton Hall offers a connoisseur tour and Brucemore has a Nooks and Crannies tour at $15 (regular tour is $7). Historic New England, however, has pushed this idea along with a membership in a special Historic Homeowner category. Participating costs $200 per year and offers “dedicated attention, knowledgeable support, and customized service that no shelter magazine or how-to guide can provide.” The receive individualized online, telephone, or email consultation and follow-up support to help select paint colors, decide on energy conservation approaches, locate contractors, and evaluate construction proposals. This entry was posted in Collections, Historic preservation, Historical interpretation and tagged Historic New England on January 22, 2013 by Max van Balgooy.